Do you encounter troubles with the process of window cleaning around your home or business premise? Your efforts are not enough to remove stains, water streaks and dust build-ups from glass surfaces? The professionals of window cleaning in Smithfield will help you out! Say goodbye to the endless hours of polishing and wiping – the skilled and experienced team will manage this burden. You will be able to make the most of your extra time – just let us do this monotonous and exhausting work for you. Our professional approach will grant you lots of benefits. We also provide our professional services in nearby areas: St Luke's, Goswell Road, Aldersgate, Holborn Viaduct, Angel. Improve the look of your office – the specialists of commercial window cleaning will deal with that. As part of our exceptional service, we use water-fed extension poles. With this method, we can clean thoroughly the exterior of your workplace, up to the fourth floor. In order to reach highly-rised windows we use rope access. We grant your windows will look great, no matter the high of the building. With the help of the squad of specialists London's skyline is never going to be dirty. We provide top-notch window cleaning by using latest equipment. We deliver gleaming and pristine look for your glass surfaces, roof windows and conservatories with water-fed extension pole system and jet washing. The poles we use are attached to water reservoirs in our vans, thus excluding the risk of damage to the exterior of your home or workplace. Plus, we use entirely safe rope access equipment to clean glasses on high-rise buildings. You can benefit from these techniques now – phone us on 020 3746 3113! With our know-how and technical expertise, you can rely on us for residential and commercial window cleaning. Your property will look perfect after our work is done, regardless what kind of windows you have. We clean single, double or sash windows, French doors, patio doors and bay windows. Moreover, we clean garden windows, skylights and conservatories. In other words, you can count on us for flawless cleaning of your windows, including the framework and ledges. The experts of window cleaning in Smithfield will revive your home. 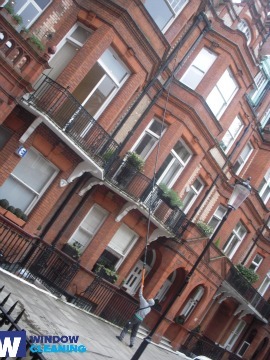 We deliver the finest window cleaning services in Smithfield. Our procedure includes water fed extension pole system and also jet washing. We protect your health and safety with non-toxic detergents and purified water. Join our satisfied customers – dial 020 3746 3113 and contact our customer support centre. You can also order our services on-site – just fill in our short request-a-quote form or use our chat feature.